Rhythmic motion captivates as it soothes— group of dancers twirling in time with the music; the wind rippling through a field of uncut hay; the waves crashing endlessly over the beach. Some of my fondest memories from summers past— still with me months and even years later—were of the ballet of cedar waxwings swooping over the pond in search of their evening meal; the bevy of yellow swallowtail butterflies flitting among the purple lilac blossoms in the warm spring sun; and a group of tall grasses swaying in the sunset. There are many ways to foster movement in our personal spaces—a beautiful wind-catching mobile; or a hedge of winterberries whose ripening fruit will surely entice a crowd of robins. 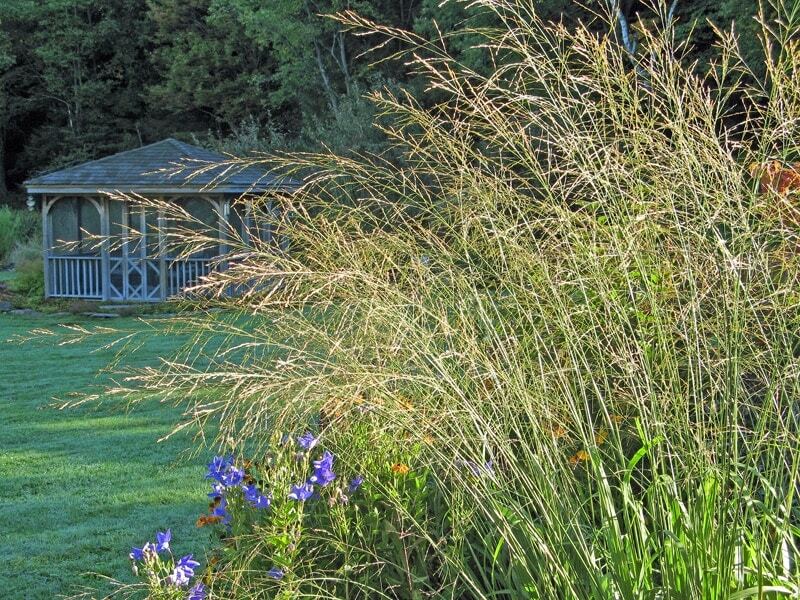 THE EASIEST WAY TO CREATE MOTION IN THE GARDEN IS WITH ORNAMENTAL GRASSES! Grasses are long-lasting and generally undemanding plants, and their graceful leaves and airy flowers dance delightfully in the lightest breeze. And ornamental grasses do more for gardeners than just create beautiful movement. Of course, different grasses do different things. There are compact grasses that form low green hillocks while others create a see-through screen. There are mighty grasses that make an architectural statement from 50 yards away and others that are like diaphanous gauze. So, as you consider which ones to use in your garden, bear in mind the other roles that grasses can play, even as they bestow that magical gift of movement to your outdoor world. These three grasses, from largest to smallest, form compact grassy hillocks. And out of these hillocks thin stems and filmy flowers suddenly appear in mid-summer, creating an undulating curtain that catches the sun and wind. These smaller grasses will also be right at home in every garden. The green hillocks of Tussock grass (Deschampsia cespitosa), which eventually span three or more feet, are no more than two feet high. But their mid-summer flowers create a billowing four-foot high cloud. that remains with you until the fall. Groups of two or three plants look great in a mixed border, and tussock grass is an excellent candidate for mass planting in a minimalist design. If you want a color other than green, and something a little more spiky, try the familiar Blue Oat Grass (Helictotrichon sempervirens). 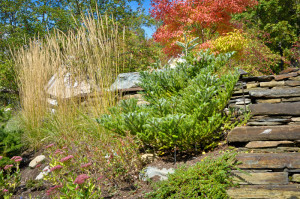 It fits nicely at the front of the border, where its blue-gray leaves will be a constant presence no matter what the season. Although Blue Oat Grass is usually chosen for its color, you will find yourself mesmerized as you watch its delicate flowers sway in a mid-summer breeze. By August the flower stalks, having achieved their mission, will start to disintegrate, so at this point I cut them off, leaving the familiar spiky blue mounds to grace the garden in fall and winter. 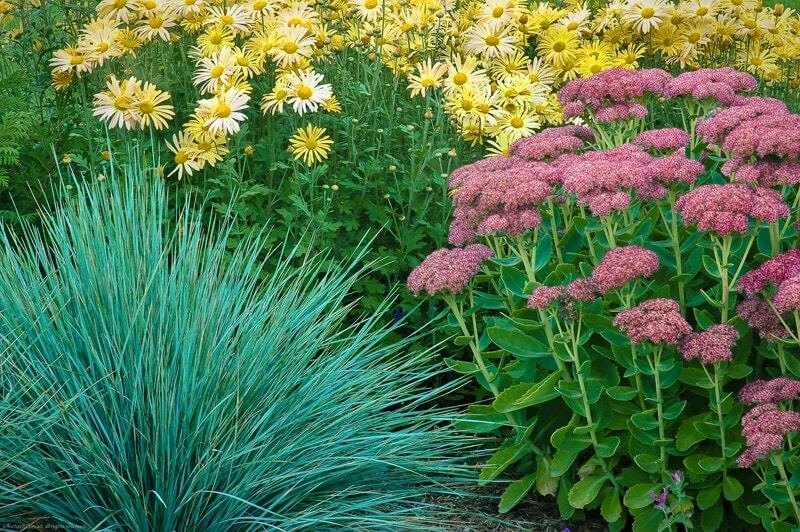 For a great fall look I combined Blue Oat Grass with the buttery yellow hardy mum ‘Mary Stoker’ and the rosy pink of Sedum Autumn Joy Sedum…a perfectly matched trio. Blue fescue (Festuca glauca ‘Elijah Blue’) is like a somewhat smaller version of Blue Oat Grass, with finer foliage and not as tall. It is also a little more work since, as for best effect, the clumps should be divided every three years or so. Purple Moor Grass (Molinia arundinacea ‘Skyracer’) is my special favorite. Its soft leaves create gentle mounds of green about three foot high. And out of these mounds emerge the most slender stems and delicate flowers imaginable—six foot high or more as they arch upwards and dance in the breeze. These are the plants I see from our bedroom window, and the morning dew in the sun looks like a million glistening diamonds. In the fall its leaves turn a pleasant yellow and the stems will remain aloft until the first big snow. More than once I have watched in amazement as a robust song sparrow clung to a single stem—which was deceptively strong—to feast on the seeds of autumn! Alas!! Purple Moor Grass is not robust enough to last through the winter, so after the first snow I cut it back to about a foot high (leaving enough of the spent leaves to protect the crowns in a cold winter). Feather Reed Grass (Calamagrostis ‘Karl Foerster’), is widely planted and its straight vertical look readily recognized. For a living fence grow a dozen plants in a straight line. On a windless day a group of Feather Reed Grass looks stiff and soldier-straight, but even the gentlest wind will impart a graceful movement to an otherwise static scene. And extra nice: the effect lasts for a full six months, from June through November. In September, just as some of the perennials are calling it quits for the year, our bigger grasses are reaching their full glory. These larger grasses work best in good sized spaces. They are mostly strong enough to withstand our winter snows without collapsing. It is a special sight indeed to see the feathery flower heads and bronzy color of a clump of Maiden Grass glow in the low autumn sun and sway gently in the wind. Maiden Grasses are big plants from the genus Miscanthus. Most of them we grow in our gardens are cultivars of Miscanthus chinensis,, and there are several to choose from, including some with wispy leaves and some stripy leaves…take your pick. I have a group of the cultivar ‘Malepartus’, robust plants that in September are topped with gorgeous six-foot high flowers, like plum-colored feathers. Even though these seem heavy in texture they too respond beautifully to the wind. And come next March they will still be around…but by then they will have turned a parchment color that looks most elegant against the snow. I am particularly fond of Miscanthus ‘Purpurascens’, a cross of unknown origin, which turns a glorious orange-red in fall. Since it grows a little shorter, it is an excellent choice for the not-so-big garden. For gardeners in southern New England and further south: in warmer climates, where its seeds are viable, Miscanthus is becoming invasive. So, if you choose to grow it, before the seeds ripen remove and dispose of all flowers. Little Bluestem (Schizachyrium scoparuim) and Big Bluestem (Andropopon gerardii) are clumping grasses that hail from the American prairies. They do best in lean and well-drained soils, and both look delightful in an informal meadow planting. They begin to flower in mid-summer, and by September the seed-heads are complemented by a lovely purple coloration in the leaves. 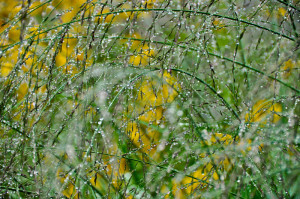 Switch grasses…Panicum virgatum–also come from the American prairies. 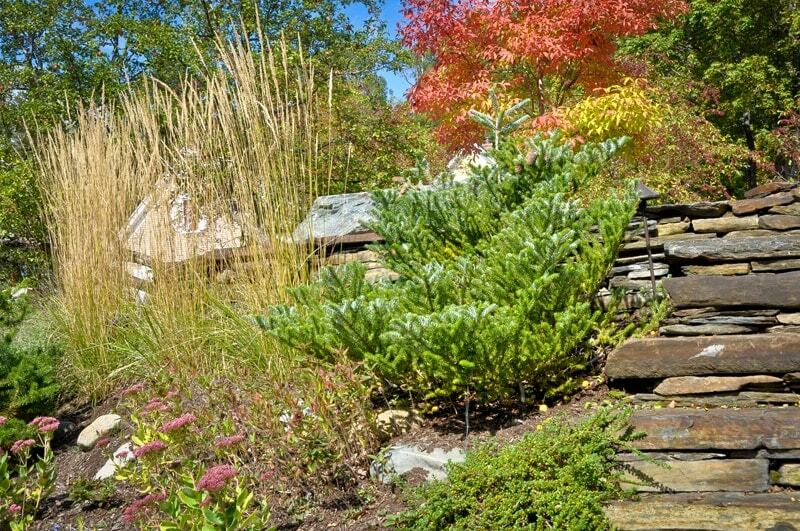 While many cultivars have been developed, both in Germany more recently in America, my personal nod goes to ‘Shenandoah’ which is especially lovely in the fall. Its graceful fine-textured flowers mature in September, just as its leaves turn a striking bronze which is visible from 50 yards away. 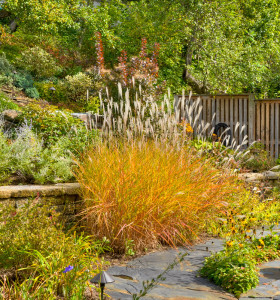 Even the smallest garden has room for some smaller grasses—such as a vertical screen of the tall but slender Feather Reed Grass, or clumps of the shorter growing Tussock Grass—to catch the breeze. 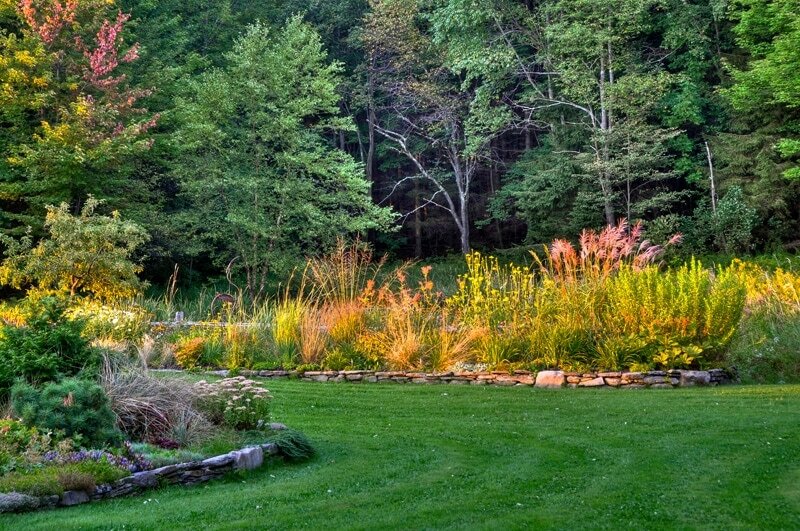 But, should you have an expansive country garden, then a stand of Shenandoah Switch Grass or a group of Purple Moor Grass will make a statement, even when seen from afar. The fine texture of grasses contrast beautifully with the easygoing personalities of perennials like Daylilies, Black-eyed Susans, Shasta Daisies and Purple Cone Flowers. Mix them together for a contemporary meadow style of planting of grasses and forbs. A clump of slender grasses looks positively diaphanous when illuminated, especially from the side or behind, by low shafts of sunlight. So, as you consider possible places for grasses in your garden, give thought to your own personal viewpoints—those places where you pause at particular times of day to enjoy a view across the garden. My secret garden viewing point in the early morning is our bedroom window, but come the evening you will most likely find me settled in another favorite viewpoint—our screened gazebo. 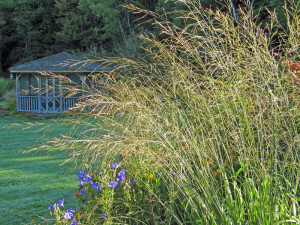 Plant some of the more delicate garden grasses— Blue Oat Grass, Tussock Grass or Purple Moor Grass are among the best— in those special garden spots where you will see them at first light or at sundown, and where they will be backlit by the sun. Pick varieties that spread by gradually enlarging their base clump, usually described as clump-forming, rather than those that spread via rhizomes—avoid anything described as ‘rhizomatous’!! You can always expand your plant collection by lifting and dividing clumps in late fall or early spring. After a decade I am still living with the effects of an experiment with Blue Lyme grass (Elymus arenarius). Blue Lyme grass offers an attractive coloration, BUT it has rhizomes that travel both wide and deep. The only way to use something like that in the garden is to grow it in a pot or contain it inside a vertical root barrier that extends three feet below ground level. Not worth the effort for this gardener! Snow or no snow out tougher grasses remain relatively unscathed through the long winter months ahead, and their skeletons, etched by the frost, look almost ghostly. 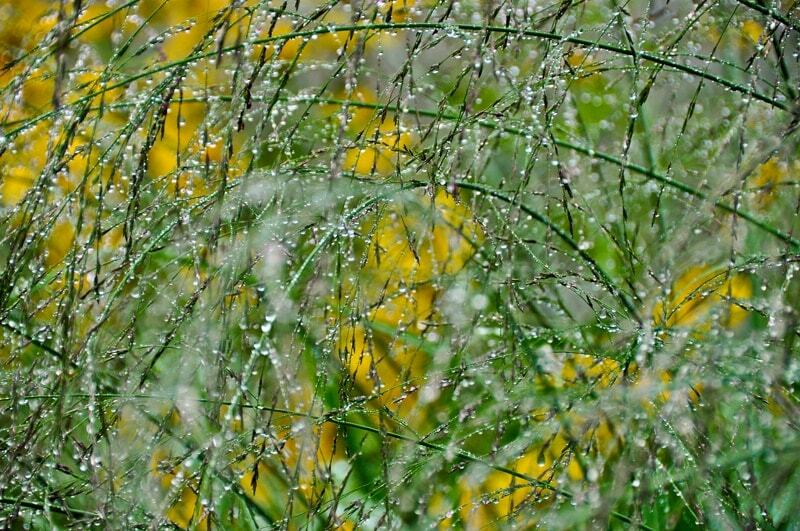 So during your fall clean-up allow the leaves and the flowers of Panicum and Miscanthus to remain standing for the winter, as well as the leaves of Helictotricon and Deschampsia. Enjoy them in the garden for another five months. Come spring, you can consign them to the compost.